Morella pensylvanica.fruit.Copyright © 2005 by Robbin Moran.plantsystematics.org (Accessed 7/2014). 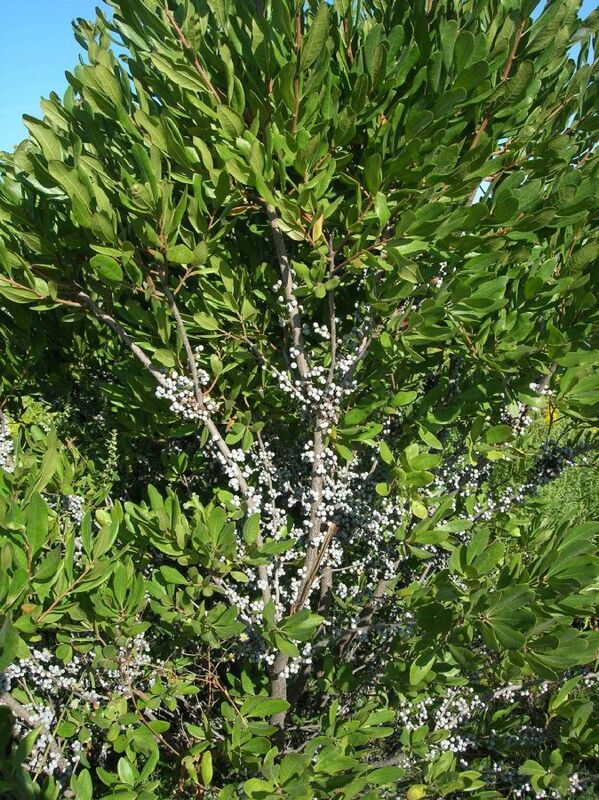 Morella pensylvanica is a shrub 0.5-2.5 m tall, dioecious (males and females on different plants); extensively colonial from root sprouts, most parts aromatic, young twigs hairy, glandular, older bark gray. Root nodules symbiotic with nitrogen fixing actinomycetes bacterium (Frankia sp.) forming actinorhizae, (Morris et al., 1974). Leaves alternate, 4-8 cm long, 1.5-3 cm wide, widest above the middle, semi-evergreen, aromatic, tip blunt, base pointed; buds small, rounded. 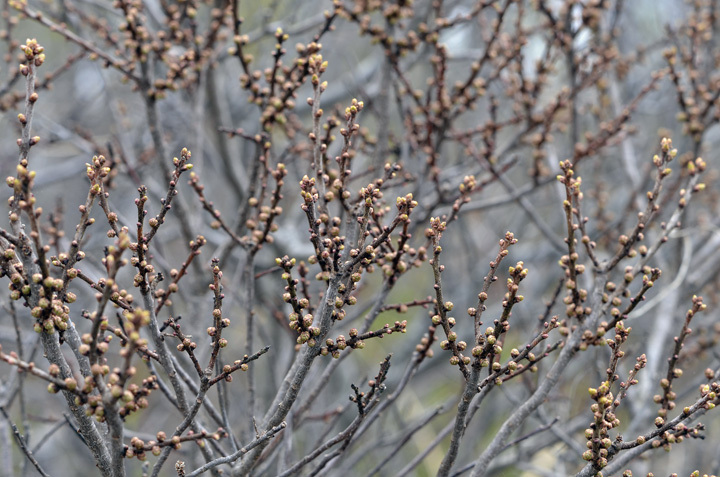 Morella pensylvanica male catkins.Robert Zottoli.Salt Water Marshes of Mid-Coast Maine (Accessed 2/2016). Flowers dioecious males in small catkins, females in small clusters, along stem below leafy branch tips, along stems below leaves; pollinated by wind, (Hall 1975) May-July. Fruit waxy, gray berries to 0.5 cm, 1-seeded, persistent through winter. Fruit eaten and seeds dispersed by numerous birds and also by rodents (Martin et al 1951). Seed load 42%. Fruit pulp nutrients: water 32%, lipid 43%, protein 6%, CHO 0% (White 1989). Waxy fruits poorly digested by most animals but yellow-rumped warblers and tree swallows and a few others can derive nutrition from the waxy saturated fats in the fruit coat making it possible to overwinter in northern regions (Place and Stiles 1992). Seeds appear to need cold treatment before germination occurs. Habitat: Woody pioneer on nutrient poor, acidic, sand and fill. Dry to moist soil, pH 5.5-7.8 (USDA, NRCS 2010). Back dune scrub, coastal areas with switch grass, freshwater and brackish tidal marshes. Tolerant of salt (brackish water to 20 ppt salt), drought, soil compaction. Tolerant of saturated soil for 25% growing season. Intolerant of shade (Hightshoe 1988). Resprouts after reburning (Hall 1975). Notes: Displaces Schizachyrium scoparium (Collins and Quinn, 1982). Twigs browsed by deer (Martin et al 1951. Attacked by the red-humped caterpillar Shizura concinna, and the fungi Apioporthe phomaspora, Diaporthe eres, Mycosphaerella myricae, Phyllosticta myricae, and Gymnosporangium ellisii (Hall 1975). 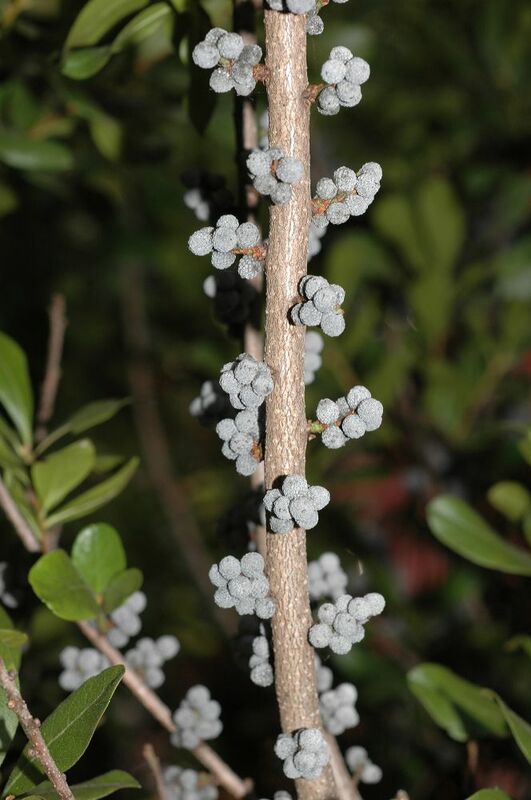 Gymnosporangium ellisii (Basidiomycotina) uses bayberry as an alternative host to juniper and causes leaf spots and possibly death (Sinclair et al. 1987).